Keeping all maintenance and related operations in Krannert Building, Krannert Center and Rawls Hall is complex work -- luckily, such multitasking is right up Joyce Fuller's alley. 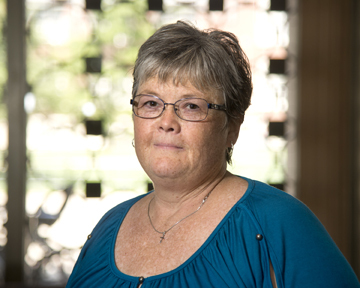 Fuller has been facilities manager for Krannert School of Management for the past 13 years. It's her goal, she says, to keep the school's three buildings running so smoothly and efficiently that their behind-the-scenes operations are virtually invisible, even to those who work and study there on a daily basis. I maintain the school's three buildings, and that means I deal with a variety of things. For needs that involve carpentry, HVAC maintenance and other skilled trades, I liaise with Physical Facilities' Zone Maintenance Department. I also work with the University's general laborers when we need to move furniture, fix roofing problems or deal with similar issues. When the School of Management does large renovation projects, I put together the requests for quotes and work with other Purdue employees on the details. Essentially, I deal in some way with anything that involves the buildings' maintenance or logistics -- from compiling phone data to arranging for computers to be set up in offices. How do you manage the school's office spaces? Keeping an inventory of who is located in which office -- and helping faculty and staff move offices between semesters -- is one of the biggest parts of my job. For example, in the summer, I probably help a total of 150 people move into new offices. At the end of each spring, we always have some offices that become vacant, usually because a faculty or staff member worked here temporarily or got a job elsewhere. One person leaving their office could trigger up to 10 moves. It's a domino effect -- once someone moves into a new office, his or her old office is vacant and up for grabs. I keep a queue in which faculty and staff are ranked by seniority, and we have a school intranet that has a map of all our offices. From May to August, as faculty and staff identify which new offices they want, I help orchestrate all the logistics involved in those moves. I even help with the small details, such as when someone wants to hang pictures or do other decorative things to their office. For me, it's important that our faculty and staff are comfortable in their offices, because if they're comfortable they're more likely to enjoy their work here. How do you juggle all the tasks for which you're responsible? I use a lot of Excel spreadsheets! But in all honesty, I truly enjoy multitasking. When things are running smoothly behind the scenes, particularly to the point where folks don't realize the maintenance and logistical work that happens here on a daily basis, I feel like I'm doing my job well. Also, in the summer when our copy center is slower, Tom Brown assists me on projects. Even when everything is going smoothly, there are certain times of the year when things are always hectic. If you add an emergency to that situation -- say, for example, there's a roof leak while a complicated renovation project is happening -- handling that can be really challenging. Truthfully, though, the more challenging my job is, the more I'm having fun. I like to stay busy, and I like knowing that I can help contribute to the school's learning environment in a behind-the-scenes way. The way I see it, our faculty and students are here to teach and study, and if maintenance or other logistical issues disrupt them, it makes everyone tense and uncomfortable. I like knowing that my good work can help contribute to their success. That's one of the things I love about working at Purdue -- people go out of their way to tell me I do a good job. I know I make a difference in their lives. It's a very satisfying and rewarding feeling.